Individually numbered 3,4,5,6,7,8,9,PW,A,SW,LW. 11 Wilson Staff Black Zip Iron Covers. studies show iron covers help retain resale values. Designed to provide the ultimate in club protection. 10PCS Black&Blue Neoprene Wilson Staff Golf Club Iron CoversHeadCovers High Quality. 10Pcs Golf Iron Head Cover(4,5,6,7,8,9,Pw,Aw,Sw,Lw). High quality Neoprene. 10PCS Black&Red Neoprene Wilson Staff Golf Club Iron CoversHeadCovers High Quality. 10Pcs Golf Iron Head Cover(4,5,6,7,8,9,Pw,Aw,Sw,Lw). High quality Neoprene. 10Pcs Golf Iron Head Cover(4,5,6,7,8,9,Pw,Aw,Sw,Lw). High quality Neoprene. Mixed Lot of 23 Vintage Golf Club Head Covers Mostly Wilson. Some leather. The Taylor Made are a little dirty.Condition is Used. Sold as is. Accommodates both midsize and oversized clubs up to 460cc. Antique Wilson Club Covers. On cover needs a little stitching on the seam. 4 covers are clean and unused. 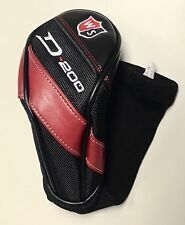 Wilson Black Jack 10.5 Driver Wood Golf Club Head Cover Black & Orange. We cannot alter this policy. It is simply for security purposes. They must be unused and still in original plastic. Wilson Philadelphia Eagles Golf Club Cover NFL Football New. Condition is New. Shipped with FedEx Ground or FedEx Home Delivery. Head cover is in great condition as the pictures will show. I would say it is navy blue in color. Very Good Pre-Owned Condition. See Pictures. You are looking at a preowned Wilson Profile Hybrid Golf Club Head Cover. Here is a great Golf Club Head cover. you get the "Wilson Wildlife Tiger" cover set. Item looks new, but I can't be sure. Box is opened. Spandex terry knit with elasticized neck. This is a 3 piece set of golf club head covers by Wilson. Excellent used condition golf club cover. Sock style. Black and blue. Excellent condition sock style Golf club head cover. Blue and black. Misc Head Covers- Lot Of 17 Adams Golf Wilson TaylorMade Etc. This head cover is in almost new condition. Please see pictures for more descriptive information on product and condition of the headcover. Buyer is to pay immediately through Paypal. I will ship item within 3 business days. Please don't hesitate to ask any questions. Thanks for looking! Also please check out my other listings happy shopping! Official NFL Product made by Wilson Sporting Goods. Official NFL Logo and Team Logo emblazoned on the head cover. Protects your valuable club heads from nicks and abrasions.